Includes two amazing spellbook designs, each with beautiful detailed artwork by Nick Deligaris! 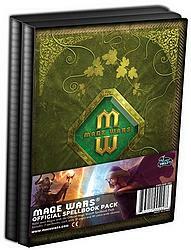 Each spellbook contains 20 pages, with four sleeves per page. That’s room for 80 spells! Spellbook sleeves are extra wide so that they fit sleeved cards. Never leave your spells unprotected!